Casadaban’s illness is important because of the way the plague bacterium had been weakened. Yersinia pestis needs iron to survive. Normally it gets this iron by stealing it from a host’s body with proteins that bind to it and help break it down. To make the bacterium harmless, scientists genetically stripped it of the proteins needed to consume iron. The hemochromatosis that contributed to Casadaban’s fate has been credited with protecting people from strains of plague that circulate in the wild. Sharon Moalem, an evolutionary biologist and author of “Survival of the Sickest,” posited that the disorder shifts iron from certain white blood cells, where it is typically sought by the plague bacterium. People of European descent are twice as likely as the rest of the population to have hemochromatosis, according to previous studies. That’s because people with the condition were more likely to survive epidemics of the bubonic plague that killed millions of people in medieval Europe and pass the hereditary condition to their descendants, according to Moalem. The day plague was diagnosed in Chicago, researchers tested the strain to make sure it hadn’t mutated. By a second emergency meeting that afternoon, high amounts of iron had already been discovered in Casadaban’s liver, adding credibility to the early hypothesis of hemochromatosis formed by his colleagues. Casadaban’s death shows that no matter how a germ has been hobbled, some people may always be vulnerable, Alexander said. It now has more in common with Hong Kong, Singapore and Bangalore than with Saudi Arabia next door. It is a textbook example of an aerotropolis, which can be narrowly defined as a city planned around its airport or, more broadly, as a city less connected to its land-bound neighbors than to its peers thousands of miles away. The ideal aerotropolis is an amalgam of made-to-order office parks, convention hotels, cargo complexes and even factories, which in some cases line the runways. It is a pure node in a global network whose fast-moving packets are people and goods instead of data. And it is the future of the global city. The basic aim of an aerotropolis is to disrupt local incumbents and monopolies using the long arm of air travel. It allows Indian hospitals to entice American heart patients for top-notch surgery at rock-bottom prices. It lets factories move out to the far reaches of western China to manufacture the iPad for lower wages while absorbing millions of urban migrants. Detroit’s leaders are even building an aerotropolis in a Hail Mary bid for Chinese investment. Floating above it all, meanwhile, are the globe-trotting executives chasing emerging markets. They are the denizens not only of Dubai and Singapore but of new business districts such as the Zuidas on the southern edge of Amsterdam, which was designed to be eight minutes from the airport by train and is home to the Netherlands’ biggest financial service firms. It is both appalling and charming, really. They can’t seem to help it. They just do this. Like cranes or marmots or Red Handed Howler Monkeys, as soon as they become sexual able, regardless of whether they are conscious of any sexual interest, human children start displaying their genetic fitness and access to resources by leaping around, exposing flesh, banging into each other, and trying to exclude others. To those who immediately protest that there are other, less primitive qualities being displayed, I roll my eyes. Yes, of course this is an oversimplification, a cynical prism with which to view Princess and Junior. But as we spend our entire conversation about youth discussing them through the prism of encouraging responsibility, and planning for the future, and instilling values — as if they were reasonable creatures instead of those who we would make reasonable — can we just take a moment to drop the polite pretense that we use to try and instruct them and face what we are really up against? They just fall into this frightening behavior and they are completely unaware of it. There was a South Park episode (Season 6: Episode 10) in which Bebe is the first girl to develop breasts, and suddenly all the boys in the neighborhood are playing outside her house, bashing each other, competing, acting like orangutans — and they have no idea why. They just do. The South Park creators are still politically correct enough to portray Bebe as having considerable insight into what is going on, but this is ludicrous. Anonymous, commenting on my Where Have All The Good Women Gone? post, described a young girl with half a skirt as if she knew what was up. Doubtful. Think of her as a type of wren. She does this, and she doesn’t know why. This is why girls argue with their mothers — well, some mothers, anyway (I hold the mom in that comment more responsible). The mother looks and says “You are communicating to every male of our species “I want to mate.” The daughter responds in outrage that this is not so, she is just trying to be fashionable, so as not to be unpopular. To her, the general social minimum, set by the other young wrens in the flock, means that she absolutely cannot dress like her mother. She does not see her own mating display, she sees that it is far less than those Other Girls, who she disapproves of as much as you, Mother. I’m about to bring the water level up to the throat, boys and girls, so those of you young ‘uns who feel you have seen through this and are above it, beware. The Mating Circle is also a Social Circle, of course, which is what makes it complicated. The social circle aspect pushes you to fit in with your age cohort, which in historical terms is as important as fitting in with your family and the larger society — maybe more. When your life expectancy is 40 and no one has enough to leave an inheritance, the people who you will go into battle with, or work with, or bear your children in the company of, or will still be alive when you take sick at age 25 and your kids are still under 10, are a more precious resource than the parents who are telling you that your skirt is too short or the swimming hole is dangerous. Fit in, but stand out. It’s hard to be young, and parents who see that your biological imperatives have to be modified for a society that requires you to pass algebra don’t simplify it. We battle against mighty forces. This Alexander Korda adaption of H.G. Wells was in 1936 perhaps the most visually spectacular movie of its time. It looks like the first thirty, black and white minutes of Sky Captain and the World of Tomorrow , yet few people watch the movie today, in part because the actors shout at each other. The distinction between “a good movie” and “a movie which is good to watch” has never been more salient. When I watched Things to Come a few years ago, I found its “prophetic” reputation odd. Wells, like Kipling before him, sees air power through the lens of Victorian gun-boat diplomacy. The strategic rationale for swift-moving expeditionary forces, be they Army or Marines, airborne infantry or special operations, is self-evident given the likelihood of counterterrorism, rapid reaction, disaster response, or stability or security force assistance missions. But in my opinion, any future defense secretary who advises the president to again send a big American land army into Asia or into the Middle East or Africa should “have his head examined,” as General MacArthur so delicately put it. Consider that, in theater, junior leaders are given extraordinary opportunities to be innovative, take risks, and be responsible and recognized for the consequences. The opposite is too often true in the rear-echelon headquarters and stateside bureaucracies in which so many of our mid-level officers are warehoused. Men and women in the prime of their professional lives, who may have been responsible for the lives of scores or hundreds of troops, or millions of dollars in assistance, or engaging in reconciling warring tribes, they may find themselves in a cube all day re-formatting power point slides, preparing quarterly training briefs, or assigned an ever expanding array of clerical duties. The consequences of this terrify me. Trade statistics in both countries consider the iPhone a Chinese export to the U.S., even though it is entirely designed and owned by a U.S. company, and is made largely of parts produced in several Asian and European countries. China’s contribution is the last step — assembling and shipping the phones. The value-added approach, in fact, shows that sales of the iPhone are adding to the U.S. economy — rather than subtracting from it, as the traditional approach would imply. 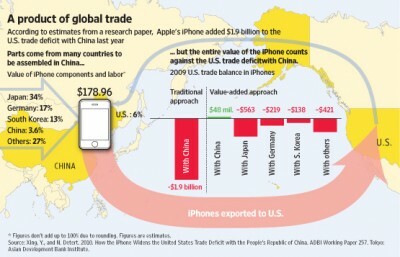 Based on U.S. sales of 11.3 million iPhones in 2009, the researchers estimate Chinese iPhone exports at $2.02 billion. After deducting $121.5 million in Chinese imports for parts produced by U.S. firms such as chip maker Broadcom Corp., they arrive at the figure of the $1.9 billion Chinese trade surplus — and U.S. trade deficit — in iPhones. If China was credited with producing only its portion of the value of an iPhone, its exports to the U.S. for the same amount of iPhones would be a U.S. trade surplus of $48.1 million, after accounting for the parts U.S. firms contribute. Who will commit a crime in the future? It should come as no surprise that the best predictor of future crime has always been past crime, and that older people are less likely to reoffend than younger ones. But some of the tools do suggest an array of surprising insights: that people whose victims were women should be considered lower risk than those whose victims were men, for example. Other tools reflect research which says that, although prison therapists might not like to hear it, a criminal’s emotional health — whether he or she is depressed, anxious, or suffers from low self-esteem — does not help predict future behavior. The consequences of getting such high-stakes decisions wrong can be devastating, as was made tragically plain last Christmas when police say a fellow officer from Woburn was shot and killed by 57-year-old Domenic Cinelli, a career criminal who had been paroled in 2008 while serving three concurrent life sentences for armed robbery. Can you give us a bit of history of Tahrir Square in Cairo? Tahrir Square came into existence 140 years ago during the time of another ruler who was considered ruthless, Ismail. He had lived in Paris, in Haussmann’s Paris and saw the changes that came about in France under Napoleon III and he wanted to remake Cairo in the image of Paris. If George Bush was the decider, Ismail was the modernizer. So he redesigned an area that was all pretty much vegetation adjacent Nile, and from time to time would be flooded by the Nile. It was known as Ismailia Square because of him. But it’s not really a city square in strict urban planning terms is it? No, it’s not exactly a square at all. For one, the Nile borders one edge, so that’s not straight. And it’s not surrounded by buildings on all four sides, it only has buildings on one side. It’s an ill-defined space that is constituted by five or six adjacent spaces, and in a sense no one really paid attention to it. Why from a design angle was it so successful as a point of protest? Ever since the project launched last April, skeptics have wondered how a film with a limited budget of $10 million, rushed production schedule, and lack of big-name talent could possibly do justice to the novel. Over a thousand pages long, with an intricate plot, epic scope, multi-layered mystery, a hero who does not appear until the final third of the story, and a complex philosophical theme, Atlas Shrugged has posed an insurmountable challenge to film-makers. The streets of Hollywood are littered with the ashes of prior efforts, some with much larger budgets. The skeptics are wrong. The completed film was shown today for the first time in a private screening. It is simply beautiful. With a screenplay faithful to the narrative and message of the novel, the adaptation is lushly produced. The acting, cinematography, and score create a powerful experience of the story. Reason ‘s Matt Welch — who, somehow, hasn’t read the book — thinks that both lovers and haters will enjoy the movie. None of this has stopped several private security companies from offering armed guards for ships. The security companies operate from countries that allow them (sometimes after payment of bribes) to have military grade weapons. The security teams sometimes travel unarmed to a port where they can pick up their weapons, and board the ship they are guarding. That works because some shipping companies are carrying rifles and machine-guns on board, but keeping them hidden from port and cargo inspectors. Large merchant ships have lots of places to hide things like a dozen rifles and pistols and a few thousands rounds of ammo. Other security companies will send out a small ship with the armed men on board, and transfer them to the merchant ship in international waters. In short, no one wants to talk openly about how this security business operates. The west’s ascendancy, he argues, is based on six attributes that he labels its “killer apps”: competition, science, democracy, medicine, consumerism and the work ethic. A killer app is not simply something good — or even something insanely great. A killer app is something small that gets you to buy into something much bigger. The first spreadsheet, VisiCalc, got people to buy an entire computer, just for that one application. So — all puns aside — the West’s real killer app was probably the gun — or the ship bristling with guns. Once you see what the round-eyes can do with that, you start thinking about adopting their strange ways. They sought to set themselves apart by enabling members to set up group dates: One member, serving as a point person, could arrange a date — a movie, say, or a picnic in Central Park — with a group of other people and thereby take some of the awkward edge off of typical dates. “In January 2010, we made the decision that we are an Indian dating site,” Mr. Sachs says. And now, with almost two million users — and 7,000 more signing up daily — Ignighter is considered India’s fastest-growing dating Web site. To put it another way, it gets as many users in a week in India as it did in a year in the United States. Next month, Ignighter will open an office in India and hire a dozen local employees. The company has stopped developing its American site, though it remains online. As funding heats up for Web start-ups in general, some investors have taken notice of Ignighter and its potential in India. This month, the company closed a $3 million round of financing. Forty percent of its investors are based in India, including Rajan Anandan, Google’s top executive in India. In the United States, Ignighter is backed by Point Judith Capital, Founder Collective and GSA Venture Partners, among others. “Here we are, a few Jewish guys sitting in Union Square, and we might have accidentally revolutionized the dating scene in India,” Mr. Sachs says of himself and Mr. Osit. They and Mr. Owocki, who is charge of Web development and programming for Ignighter, have never been to India — though they now plan to make frequent trips there. From there, it grew in part because dating in India is still in a somewhat embryonic stage. It happens in big cities like Mumbai and Hyderabad, but in many less cosmopolitan parts of India it’s still considered taboo for unmarried men and women to be seen in public together. Many couples, as they have for centuries, meet through arranged marriages that their relatives orchestrate. But for some in this generation — those raised on a diet of MTV and social networks — there’s a desire to find new dating scripts, or just to hang out with a coed group. The group dynamic also makes going out an easier sell to parents, who are worried about safety and propriety.